Troop 48 meets at our clubhouse (affectionately referred to as “the shed”) in the field next to Holy Communion Lutheran Church (442 South Route 73 in Berlin, NJ, directly across from the Wawa gas station). Our meetings are Wednesday nights from 7 pm until about 8:30 pm. If facing the front of the church (with Route 73 at your back), you should look right across the field. The building with the cars parked on the lawn in front of it is “the shed”. The image below shows the two ways that you can drive up to where we park. 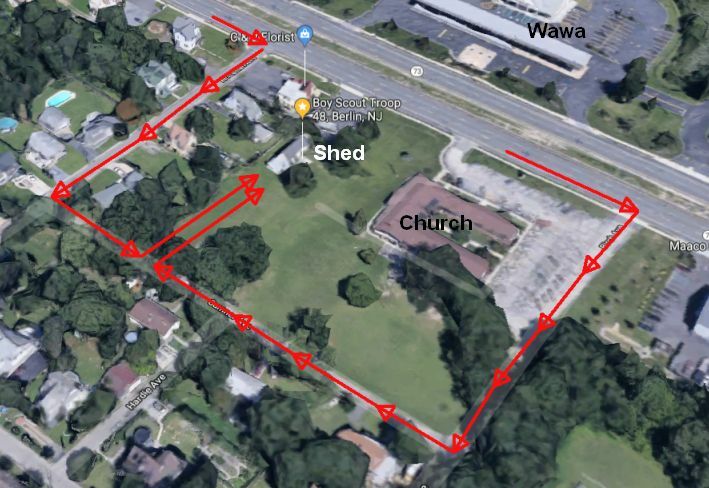 Please do NOT drive directly from the church parking lot down to the shed.